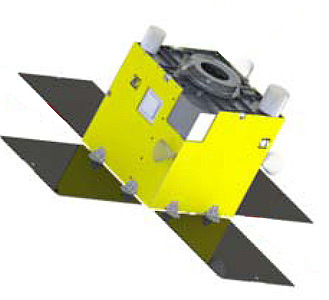 PROCYON (Proximate Object Close flyby with Optical Navigation) is an experimental asteroid fly-by probe developed by JAXA. The probe with a mass of only 59 kg was to perform an close fly-by to an asteroid by using optical navigation. Two more asteroid fly-bys were planned. PROCYON was launched in mid 2014 on a H-2A-202 rocket with the asteroid explorer Hayabusa 2 as the main payload. The target asteroid for PROCYON is 2000 DP107, which has small moon. PROCYON's ion engine has operated for more than 223 hours in total. Thrust is 366 µN, more than the specification of 300 µN. The ion engine's high voltage power trouble is the most problematic situation, which might be caused by small metal debris. If the problem is not resolved end of April 2015, the planned Earth fly-by on 3 December 2015 and the asteroid fly-by observation on 12 May 2016 will be difficult. In early May 2015, the plans to visit asteroid (185851) 2000 DP107 were abandoned after recovery of ion thrusters failed.